Soldiers stand guard after December 2008 post-election riots in central Nigeria leave hundreds dead. (CNN) -- Umar Farouk AbdulMutallab wouldn't have to go to an al Qaeda training camp in Yemen to learn how to hate. He had plenty of examples in his own country. AbdulMutallab is the 23-year-old Nigerian being held for allegedly trying to blow up a Detroit-bound airliner on Christmas Day. While much attention has focused on his privileged background, less has been said about the religious conflict in his homeland. Christians and Muslims have been killing each other in Nigeria for much of AbdulMutallab's lifetime. At least 10,000 Nigerians have died during Christian-Muslim riots and ethnic violence during the past decade. The most populous country in Africa, Nigeria is almost evenly divided between Muslims and Christians. It has become the focal point of Christian and Muslim groups -- in Nigeria and abroad, says Eliza Griswold, who has spent the last five years traveling to Nigeria to examine the causes of religious violence. "Nigeria has become a battleground state for Christians and Muslims around the world who see themselves involved in a numbers game," says Griswold, author of "The Tenth Parallel," an upcoming book that explores the tension between Christians and Muslims just north of the equator in Africa and Asia. "Any Christian or Muslim who has the point of view that numbers matter has a stake in Nigeria," she says. The divisions between Christianity and Islam are more than symbolic in Nigeria. There's a geographic boundary: Nigerian Muslims tend to live in north, while Christians live in the south, Griswold says. Many Nigerian Muslims see themselves as standing at the southern tip of the Islamic world, Griswold says. To the immediate south lie many African nations that tend to embrace Christianity. "There is this attitude that Islam is under siege by the Christian West and, by proxy, Nigerian Christians," Griswold says. "There is this sense among some devoted Muslims in the north that we need to be part of the larger Islamic community, and we need to prove that we belong." That tension can cut both ways. Talk to some Nigerian Christians and one can hear the same concern as Nigerian Muslims: We are under attack; we have to preserve our autonomy. Gbenga Akinbola, rector of the Mount Zion Anglican Church in Chicago, Illinois, has experienced religious tension in Nigeria. He led a congregation there only four years ago as a priest in the Nigerian Anglican Church. He says Nigerian Muslims once tried to officially declare Nigeria a Muslim state and force some Christians in the north to adopt Islamic customs. Both Christians and Muslims feel that they represent the one true God and are obligated to convert others, Akinbola says. "They are doing what the leaders of both of these groups tell them to," he says. "Christians preach to Muslims, and Muslims try to do the same. For Christians, Jesus Christ has told us to go out and preach." Sometimes, people don't want to be converted. And at a time when many young Nigerians are unemployed and looking for scapegoats, violence can easily follow, some Nigerians say. In November 2008, at least 700 Nigerians died in Christian-Muslim riots that followed a disputed local election, Human Rights Watch reported. 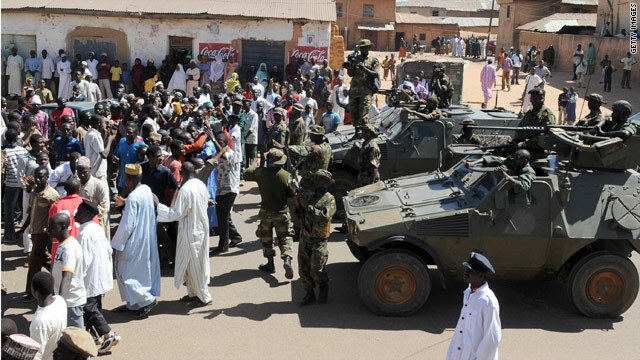 Two years earlier, the Nigerian army was mobilized to halt similar rioting after a Danish newspaper published a cartoon that depicted Mohammed, the founder of Islam, in a caricature, according to CNN reports. The event that arguably attracted the most attention in the West took place in 2002 when the Miss World Pageant was relocated from Nigeria after Christian-Muslim riots killed 200 people. Violence begets more violence, Akinbola says. "When they kill Christians in the north, Christians in the south will retaliate against Muslims," he says. He adds that the tensions between Christians and Muslims in Nigeria date back to British colonial rule. He says the British traditionally awarded political leadership positions to members of the Muslim majority in the north. British colonial rule ended with Nigeria's independence in 1960. But some Nigerian Muslims still feel as if they are entitled to rule Nigeria, he says. "If you see a license plate in one of the northern states, you'll often see an inscription that reads 'Born to rule,' '' Akinbola says. The ferocity of religious disagreement is also fanned by unscrupulous political leaders, says Mohammed Ladan, a Nigerian Muslim who now works as a pharmacist in Atlanta, Georgia. "Some of the politicians engineer this violence for their own political end," Ladan says. "If they can play Christians against Muslims, it can take attention away from the real problems of society." Ladan says he never felt persecuted by Christians while growing up in northern Nigeria. Like several other Nigerians interviewed, he says it would be simplistic to say most Nigerian Christians and Muslims are engaged in a permanent civil war. Several Nigerians told stories of having friends and even siblings of another faith. "My wife is a Christian. Some of my best friends are Christians," he says. "I can sing Christian hymns because I've been to church with my wife and friends, and they come to my Muslim celebrations." Other Muslims say the religious violence is a symptom of a deeper problem in Nigeria: widespread poverty and corruption. Saratu Abiola is a Nigerian who shares some of the same background with AbdulMutallab, the suspected terrorist. She is also 23 and a Muslim who left Nigeria to attend an international boarding school. Abiola, a recent graduate of the University of North Carolina at Chapel Hill, says many Nigerians turn to religion because they don't think they can rely on the state. Though the country is rich with oil wealth, the cities are full of beggars and prostitutes -- it's common to see police officers brazenly demanding money at checkpoints, she says. "People here get shocked by scandal," Abiola says of America. In Nigeria, "we just shrug our shoulders and drink our coffee. We expect the worst conduct from our high officials." The corruption and poverty are so embedded that it even disturbs those few Nigerians who can avoid the problems, Abiola says. "There's a real sense of despair, even among the ones who are better off," Abiola says. "They see what is going on, and they wonder: What on earth can you do to fix this?" Faith becomes the fix for many Nigerians, she says. "They feel wronged," says Abiola, who now lives in Washington. "They feel like the country has passed them by. When people don't have much, religion becomes more important." Despite the country's history of religious violence, Abiola says she's still surprised that a young Nigerian Muslim would be accused of trying to commit mass murder against American citizens. Many Nigerian youths love pop culture in America and adopt Western ways and watch Western movies, she says. "We have MTV in Africa," she says. "Every year, we get at least five to 15 U.S. pop stars who come to Nigeria." She says many young Nigerians learn to blend their Nigerian identity and their religious values with their love of pop culture in the West. "For a lot of us, it doesn't present a burden -- we don't feel as if we have to choose between the West and the East," she says. Griswold, the author who just spent five years in Nigeria, says events in Nigeria prove how small the world has become. "When we, a thousand miles away, debate over whether we should be in Afghanistan or draw a cartoon, the people in Nigeria take up arms and fight it out," she says. "They end up bearing the brunt of our religious debates in a very visceral way."